Sometimes father doesn't know best. The first time Winter Park was recommended to me for a family ski vacation, I flat rejected the idea. A year or two later, I took the kids and went. We've been back often. Okay, so what makes this resort better than others? Fair question. In fact, Winter Park may not be better - if you prize elements like: a plethora high-end shopping, a deluge of expensive gourmet restaurants, thousands of condos built into the mountain, a glut of fur coats and designer clothes. If you choose to leave your designer skiwear at home (oh, you can wear it here, you just won't have a lot of company) and value having fun, Winter Park excels. You can't top this mountain (two mountains actually - Winter Park and Mary Jane) for its combination of terrain variety and ease of use. Sure, it's big, and the hot-shots in your crew will find bumps, steeps, trees and bowls to keep them happy. But, unlike many large hills, it's fairly easy to find your way around. Other excellent elements? Discovery Park, a novice zone placed away from the base area so it gives newcomers a sense of actually being on the mountain while segregating them from higher-speed snowsliders. My kids raved when, already good skiers at ages nine and eleven, they learned to snowboard here. Vasquez Ridge, an isolated haven of intermediate cruisers. Parsenn Bowl, where true intermediates can actually experience bowl skiing at (gulp!) 12,000 feet. A collection of runs with Alice in Wonderland names (Jabberwocky, White Rabbit, March Hare, Cheshire Cat, etc.) that secret a lot of squiggly single-tracks among the trees. And, my personal favorite: a blue-rated highway called Cranmer, which holds the niftiest little bump field along its right side - perfect practice for the serious challenges on Mary Jane. The Winter Park Children's Center does have a serious problem - it's way too popular. Reservations are a must, especially on weekends. Dropping your kid off in the morning is like entering a beehive; but, seemingly without strain, each kid is attended personally and professionally. Last time there, I skied with a kids' lesson, and was amazed that at mid-mountain at mid-morning they re-sorted the groups so all the kids were skiing with their skill-level equals. Best, the learning derived from having fun - like skiing/riding on wiggly trails to learn absorption/extension - not from "working on" things. Fun is the bottom line, yes? Pricing? This is skiing, so I'm not going to fool you and say it's downright cheap to come here. But, in the relative scale of things, it's affordable. You can spend serious bucks and stay slopeside in the new Zephyr Mountain Lodge; or, you can save seriously by lodging in a motel in town, a condo in Fraser (about 10 miles away), or in a lodge room at Snow Country Ranch. Free busses run to all spots, so it's even do-able without a car, albeit not the most convenient thing. In most places, we prefer to stay slopeside, but Winter Park's range of town accommodations, combined with the decent transportation, makes in-town equally preferable. Same goes for the dining. Yeah, there are a few pricey spots, but on the whole, there's darned good eating at reasonable tabs. Among our family favorites: Hernandos, The Last Waltz and Wild Creek. And, if you're condo-ing it, you can stock the fridge at the supermarket in Fraser. An off-the-slopes must if you've got an 9-15 year-old: snoscoots. They're miniature snowmobiles that kids too young to drive full-sized machines absolutely love. The snoscoot track is just west of town. Then, there's Snow Mountain Ranch/YMCA of the Rockies. Here you can ride horses, swim indoors, roller skate, play basketball, do crafts, climb the indoor wall, snowshoe and Nordic ski. You can lodge here, as well - in anything from a bunk room to an completely modern, individual cabin - for extremely reasonable rates. They run their own ski area shuttle. 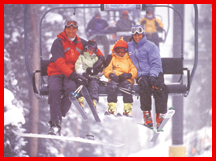 There's also tubing in Fraser, ice skating in downtown Winter Park, snowshoeing on the mountain, dog sled rides, horse-drawn sleigh rides, and several Nordic skiing sites. But, for us, it's the little things that elevate the Winter Park experience to rank among the best: sleds are provided to shlep your little kid and/or stuff from the skier drop-off to the slopes; trains arrive right in the base area (and you can ride the train here from Denver); people with all kinds of disabilities are sliding around, which subconsciously communicates to your kids a can-do attitude; the ability to store ski-school participating kids' rental gear slopeside at no extra cost; putting honey on your pizza crust at Hernandos to create "desert" out of something many kids don't eat; a welcome lack of glitz; and a very welcoming attitude. 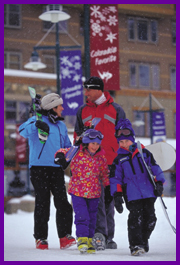 Or visit Winter Park's website at www.skiwinterpark.com . ...... Mitch Kaplan is the author of "The Unofficial Guide to the Mid-Atlantic with Kids," "The Cheapskate's Guide to Myrtle Beach" and "The Golf Book of Lists". He is a contributor to "The Unofficial Guide to New England & New York with Kids" and to the annual guide "Ski America & Canada".